1980S ESSENCE Petaluma’s Honey Toads draw sonic inspiration from bands like the Smiths and New Order. While the four members in Petaluma indie-rock outfit the Honey Toads average out at 22 years old, they go back nearly a decade, having played together since their first year of high school. Musically, the Honey Toads deliver a confidence in their lyrics and tightness in their rhythms that belies their age and has gotten them widespread notice since the Huffington Post debuted their inaugural single, "Send Me Out," last September. This week, the Honey Toads release their excellent second single, "Plastic Smiles," with a show at the Phoenix Theater on April 13. 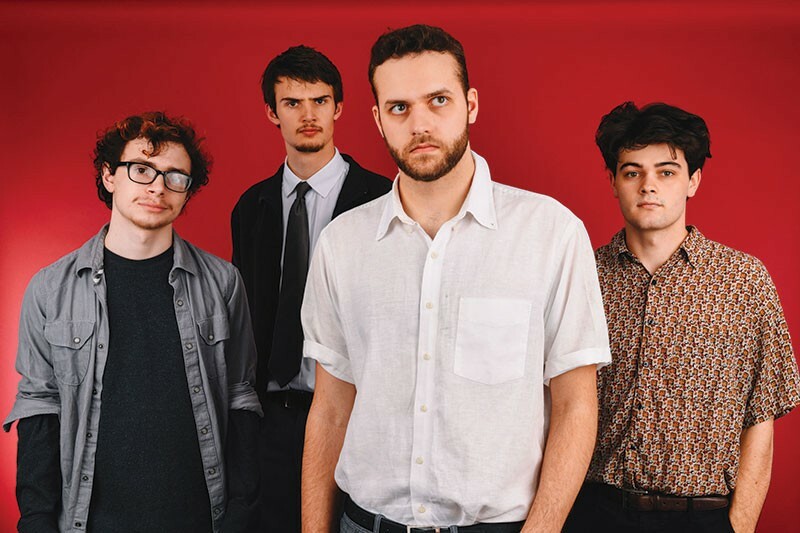 Vocalist and electric ukulele player Nick Cafiero, guitarist Jack Hogan, bassist Joe DeMars and drummer Dominic Bergamini all take cues from vintage proto-punk and new wave sounds of the late '70s and early '80s. "A lot of us grew up listening to bands like New Order, the Smiths, the Talking Heads," says Cafiero. "Those bands had great guitar players, but they also had really prominent bass lines." With that in mind, DeMars leads the band with complex bass hooks driving the songs, while Hogan's guitar riffs repeat for atmospheric effect and Cafiero's vocals echo David Byrne's yelping urgency and Morrissey's wistful cadence simultaneously. Not ones to be mired in nostalgia, the Honey Toads mix it up in the form of Cafiero's electric ukulele, a solid-body prototype that he plays like a rhythm guitar. "I sort of fell in love with the ukulele at a pretty early age," says Cafiero. He even convinced his high school jazz band to let him play the instrument. "It was a bit unorthodox," Cafiero says, "but I was able to prove you can do a lot with it." This prototype ukulele, which Cafiero received from Petaluma's Kala Brand Music Company where he works, produces clean tones that resemble an electric jazz guitar and adds a rhythmic background to Hogan's arpeggio guitar lines. The overall effect gives plenty of depth to the band, and the new single is their strongest work yet, as "Plastic Smiles" boasts both compelling, danceable hooks and relatable lyrics about trying to fit in. "The song is a bit about feeling young and ignored, and that reaction to it," Cafiero says. Now one of the hottest bands in their scene, the Honey Toads are happy to unveil "Plastic Smiles" and pass out free T-shirts this week in their hometown. "We like to put on a show," Cafiero says. "There will be a lot of fun, banter and dancing." The Honey Toads play on Friday, April 13, at the Phoenix Theater, 201 Washington St., Petaluma. 8pm. $8. 707.762.3565.